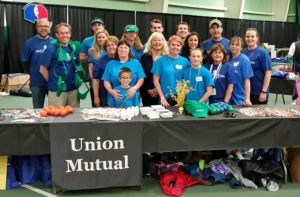 Union Mutual of Vermont presents the 2017 Special Olympics Vermont Summer Games June 3-4 at the University of Vermont. Nearly 600 athletes will compete in basketball and bocce. For 2017, Special Olympics Vermont is has reorganized its sports seasons in order to provide more high quality sports training and competition opportunities for children and adults with intellectual disabilities. The thirteen Olympic-type sports offered are now organized into four distinct sports season: Winter, Summer, Fall, and Holiday Games. For all statewide competitions, teams travel from every Vermont county for the opportunity to compete in a statewide tournament against the best athletes in each division. The weekend begins on Saturday, June 3 with preliminary bocce and basketball games. Athletes will also have access to free health screenings in three disciplines: Healthy Hearing (audiology), Special Smiles (dentistry), and Opening Eyes (vision) thanks to a large team of local practitioners and students who volunteer their time and expertise. The Opening Ceremony event will take place in Patrick Gym featuring the culmination of the Law Enforcement Torch Run. Darren Perron, award-winning reporter and Executive Producer for WCAX-Channel 3 News will emcee the event and celebrity guest, Amanda Pelkey presented by Union Mutual, will address the crowd. Pelkey is a Montpelier native and member of the US Women’s National Hockey Team. Opening Ceremonies is open to the public and all are welcome to come experience the joy.